Mininfra SmarT® and SmartT SW® are the flagships of Mininfra grain analysers. The advanced technology, up-to date calibrations and the networking functions make this model a suitable solution for larger businesses (producers, storages, receiving stations, laboratories, etc.) operating on more sites. Mininfra SmarT® and SmartT SW® are supplied with all the available calibrations. Handling of the instrument is very comfortable due to its built-in printer and the big size colour touch screen display. Its USB port allows to save the measuring results on pen drive. As an option, the instrument can be used by bar code reader. Mininfra SmarT SW® contains an additional hectoliter weight module too. The instrument can test the specific weight of wheat and barley: besides the common parameteres of the crops you can get a reliable hectoliter weight result within the same analysis process. New flour cuvette: The cuvette is offered as an optional accessory for hopper-type models. The use of the cuvette makes flour analysis more clean, simple and stable. Mininfra Scan-TPlus portable grain analyser provides an affordable option for smaller businesses. Due to its small size, light weight and easy handling Mininfra Scan-TPlus is designed specifically for on-farm, or even on-field analyses – thank to its 12V power supply. The "Omega Analyzer G" is a versatile instrument for grain analysis and is capable of handling grain and seed such as wheat, barley, corn, rice, soy, rapeseed and more. This instrument offers USA NTEP certification and a host of upgrade options and accessories. Whole grain and seed analysis including: corn, rice, wheat, barley, oil seeds, etc. Optional Micro Cell measures flour, powders, and small amounts of grain. Universal calibrations are available for protein, moisture, fat, starch, fiber, gluten, sedimentation etc. The MultiCheck is the most versatile instrument in the NIR analyzer line and is capable of performing measurements in both transmission (wheat, barley, corn, rice, soy, oil seed and more) and reflectance for easy and precise measurements of fine powders such as flour, meal, mixed seed, coffee, tea, or any homogenous substance. 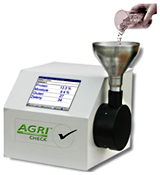 The AgriCheck™ is a cost effective solution for grain and seed analysis. While not as versatile as the OmegAnalyzer G, it offers the same accuracy and performance in a compact package. With optional top mounted reflectance mode (AgriCheck Plus): flour, meal, tea, coffee, spices, powders, pastes..